It is with great pleasure we can provide you with a summary of the considerable number of papers that were presented by our members at the WAIMH meeting in Rome. There were 32 NBO-related presentations and an additional 31 presentations by our network members on related infant mental health themes. We have selected these presentations from the WAIMH program and have placed them here so that you can take a look at them for yourself. If we have inadvertently omitted anyone’s presentation, please tell us at newborninfantnetwork@gmail.com so that we can remedy that. Thanks especially to Cristina Granda, our intern this past year, for helping put this material together. Sunday May 27th, in particular, was an exhilarating day in that there were three symposia which focused on the NBO, while there were numerous posters and oral presentations across the four days, featuring work with the NBO, in particular. The first of the NBO-focused symposia was entitled “Lay practitioners reaching parents and infants who are hard to reach, with the NBO”, and was chaired by Susan Nicolson, from the Royal Women’s Hospital in Melbourne, while Kevin Nugent was the discussant. Nicki Dawson and Katherine Frost described their work with lay practitioners in Alexandra Township in Johannesburg, South Africa. They discussed the NBO training process and the role of reflective supervision in their work and the challenge of “finding the baby” through the NBO. Wendy Kennedy described her project with homeless parents in Boston and discussed the training of community practitioners, who themselves had a history of homelessness and associated trauma. Kathy Crouch, in her presentation, “Wonder Words: antenatal yarning”, discussed the connection between land and place in her work with Aboriginal parents in Australia and the important role of local elders in introducing the NBO. She describes the NBO session as a story-telling event, a cultural community event, with the baby’s story – Yarn – at the centre. Susan Nicolson described the appeal of training lay practitioners in the NBO to extend IMH support to families in resource poor and culturally diverse populations who are best served by family workers in terms of cultural safety, trust- building and uptake of services. The need for local material and reflective supervision was emphasized. The second NBO symposium on Sunday was entitled, “The Need for and Challenge of a Relationship focus in the Neonatal Intensive Care Unit” and focused on the use of the NBO in NICU settings. It was chaired by Neonatologist Natalie Duffy, from the Royal Women’s Hospital, Melbourne. Kari Slinning and Unni Tranaas Vannebo their NBO colleagues in Oslo studied the use of an adapted version of the NBO in the NICU and described how nurses were trained to use the NBO with at-risk infants. Natalie Duffy and her Melbourne colleagues described their work with the NBO in the NICU with babies less than 37 weeks gestational age as a way to reduce parental stress and prepare parents for the transition to home. 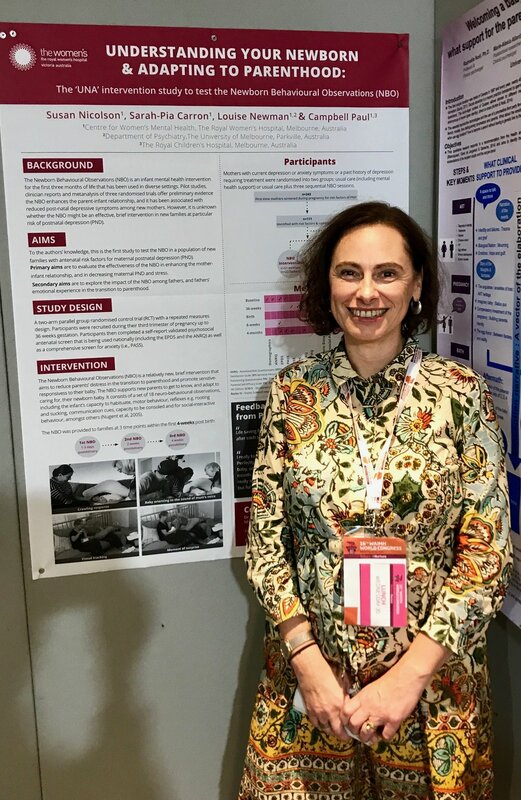 Natascha Schuetz Haemmerli and Eve Cignacco and their colleagues in Bern described the NBO as an integral part of a family-centered care model, which featured a newly established Advanced Practice Nurse (APN)-led model of transitional care. Betty Hutchon and her UK colleagues described the EISMART approach to engagement with families and went on to show how the NBO can be used to help parents read their baby’s cues and build a relationship of trust. Megan Chapman and Campbell Paul and their colleagues at the Royal Children’s Hospital in Melbourne, described their use of the NBO in “rounding” in an infant mental health ward. The third NBO symposium on Sunday, May 27th, “Exploring the Newborn Behavioral Observations system (NBO)”, was chaired by Unni Tranaas Vannebo and included 7 brief oral presentations on the NBO and two on Touchpoints. Claudia Gold introduced the session by describing the NBO and providing a sampling of the evidence for its effectiveness as a form of intervention. She went on to address the challenge of using the NBO to “build community” by listening to newborns and parents in a range of community settings. Hanne Kronberg and Ingeborg Kristensen and Merethe Vinter described their four-municipality Danish RCT, University of Aarhus, study (n=2596), which features on the use of the NBO in a hospital/home visiting parenting intervention program. Alex Harrison, described how she and her colleagues use the NBO to support caregiving relationships in India, Guatemala and Peru. 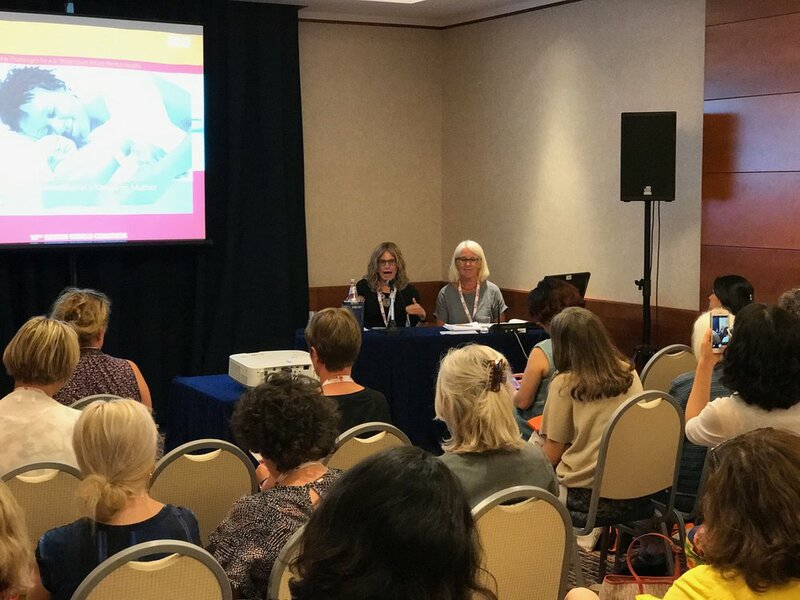 Claudia Gold and Donna Elmendorf and Kate Jewson’s presentation, “Creating a community Holding Environment for Parents and Infants using the NBO” described their work with the NBO in a rural community setting in the United States. Sabina Maharaj and her colleagues Nicole Canin and J. Gaylard from the Ububele group in Johannesburg described their clinical experience using the NBO with mothers who were anxious or stressed and showed how it provided an entrée into the mother’s state of mind. Tawali Shah and his associates from the Xi’an China NBO group, reported the results of their RCT study (n=105), which demonstrated that parents involved in the NBO had lower anxiety levels and improved breastfeeding rates, while NBO intervention babies showed enhanced social interactive behavior. Included in this symposium were two Touchpoints related presentations: Fabia Banella, Luca Migliaccio and Gherardo Rapisardi reported on their study entitled “Trainee narratives in the reflective practice process of Individual Touchpoint training: a qualitative analysis”. Ana Teresa Brito provided a description of Touchpoints training program in Portugal, “Brazelton Touchpoints in Portugal, Enhancing a Cascade of Care”. Jessica Dym-Bartlett and Kevin Nugent presented the results of their RCT NBO study which showed positive effects on maternal sensitivity in the “Bridging the Knowledge to Practice Gap” symposium, chaired by Sherry Madigan. Alex Harrison spoke in the symposium, “Infants and Families in Need Across the World” about her infant mental health training model in India and how the NBO was an integral part of the training. The symposium was chaired by Campbell Paul. Alex Harrison also chaired a symposium entitled, “Protect Nurture and Enjoy (PNE): Infant Mental Health Training in low to middle-income countries”. Beulah Warren contributing to the symposium on “Infant Mental Health in Intensive Care”, by describing her experience with reflective practice among intensive care staff. Campbell Paul and Susan Nicolson both discussed the role of surprise in the Symposium on “The role of surprise in therapeutic work with infants and families” and on the role of the NBO in facilitating this kind of response. Beril Bayrak described her use of the NBO with teenage mothers in group homes in Turkey. J. Braden, Campbell Paul, Susan Nicolson, J. Paul and A. Buist investigated the experiences of nurses using the NBO. Alex Harrison presented her work on the use of the NBO in training health workers in developing countries. Susan Nicolson and her colleagues from Melbourne, Sarah Pia Carron, Louise Newman and Campbell Paul presented the UNA Intervention Study, an RCT study designed to test out the impact of the NBO. Eiko Saito and Mariko Iwayama and their colleagues Masako Nagata and Shohei Ohgi, discussed the obstacles and efficacy to introducing the NBO to Health Care Providers in Japan. Hui Li and her colleagues in Xi’an described the role of prolactin in an intervention with mothers who displayed perinatal anxious symptoms. Rakel Greve, Kari Slinning, Nina Cheetham, Hege Sandtro, Unni Vannebo, E.O. Kallevik and Inger Pauline Landsem presented their findings on their on-line NBO mentorship training program in Norway. Kristie Brandt spoke on “Brain-based reflective practice” in the symposium the application of the neurosequential model of therapeutics on three different continents. Carmen Norona and her colleagues conducted a workshop on “Who is thinking about the Babies? The Impact of Immigration Policies on families/parent-child well-being in the United States”. Susana Nicolau, Jeanette Appleton and Kim Benn from the UK Brazelton Centre presented on their prenatal work with parents in the UK. Carmen Norona presented another workshop on a tool to promote social justice and diversity-informed practice. Roseanne Clark presented a workshop on the development of the Parent-Child Early Relational Assessment - Short form. Hui Li and her team at the First Affiliated Hospital Jiaotong University Xi’an, presented a video presentation “A cerebral palsy child recovered under filial psychotherapy combined with individual family rehabilitation training”. Inger Pauline Landsem, Jorunn Tunby and Nina Cheetham presented their findings on their regional knowledge-sharing network in Norway. Roseanne Clark and Linda Tuchman spoke on their study evaluating the integration of mindfulness in their infant mental health certification program. Susan Mudra and her colleagues spoke on pregnancy and childbirth related anxiety. Susan also presented on couples prenatal bonding to their child and pregnancy related concerns. Nadia Bruschweiler-Stern and E. Quagliata presented a workshop on Explorations in Parent-Infant work around match and mismatch during pregnancy and early life. Campbell Paul and J. Conrick presented a workshop on “The Adopted Woman as Mother”. Campbell Paul and T. Frances presented their work on infant psychotherapy with very sick premature babies. Campbell Paul examined the question, “Why is this happening to Me?” – how the infant experiences prolonged separation in a symposium on “Sick infants and the People who care for them”, in a symposium, which he also chaired. Campbell Paul facilitated a poster workshop, “Parenthood and child Disability”. Nicki Dawson and Katherine Frost and colleagues presented a symposium on “Why reflective supervision is a priority for frontline staff”. Nicki Dawson also presented a poster on “”Sensitive” from an African perspective”. Rochelle Matacz and Lynn Pridis presented on “Developing and Evaluating an Interdisciplinary Mental Health Program for General Practitioners” in the above symposium. Lynn Pridis and her colleague, J. Howleson presented a brief oral presentation on “Mentalizing for the Young Child in Parental Mediation”. 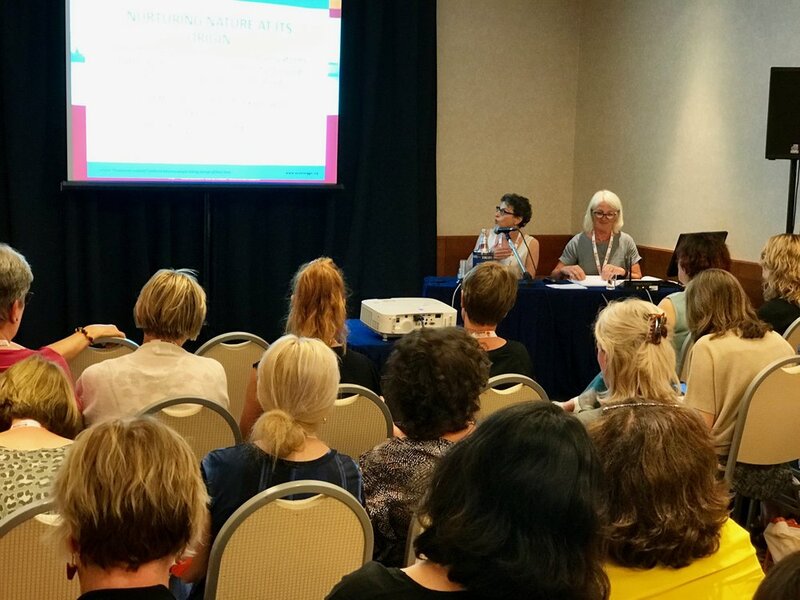 Patricia O’Rourke chaired a symposium on the Maternal Looking Glass Guide, while Rakel Greve described the results of a study evaluating the use of the Maternal Looking Glass Guide in Norway. Hanna Lampi and her colleague A. Leskeia Ranta (Finland) presented a video presentation on “Nurture and Play Group for Fussy Babies and their Moms”. Megan Chapman and her colleague, C.Marraffa, presented a brief oral presentation called, “The Benefits of a Sabbatical in an Infant Mental Health team for an old paediatrician”. Nick Kasovak presented a poster on Fathers and the Fan model. Karin Stjernqvist and Johanna Mansson presented the results of the Swedish longitudinal on extremely preterm infants. Fabia Banella and her colleagues presented a brief oral presentation on “Neurobehavioral Development and Early Regulatory Problems in very preterm and low birthweight infants”.